I try never to pass up an opportunity to hear a director speak about his or her film, regardless of my feelings on it, because my appreciation and understanding is always expanded. I have seen films that left me completely cold, until I hear the director talking about all the ideas they were chasing in the process of making it and I get caught up in the sincerity of their intentions and the fascination they hold for their subject. Then it becomes a whole different film. The other day I had the opportunity to hear James Cameron speak about Avatar. As I pretty much expected, a high degree of the discussion went straight over my head. Image based special capture process? Huh? Negative space compositions? Wah? Polygonally optimized environments? How’s that again? Sitting amongst a knowingly focused audience, occasionally nodding their heads, I was definitely out of my depth. What I gained a greater appreciation for was the tremendous risk entailed in making that movie. He had an intention to do something on the technological cutting edge and he had to demonstrate to the studios that he could pull it off. He did a year and a half of research and development during which he had to create a fantastic world and then conceptualize the creatures that inhabit it. Then he had to show that he could make it all happen technologically. His success at this enabled him to get the studio greenlight necessary to then continue toiling in that world, at which point he went into the traditional production phase, with actors and cameras and the like (well, sort of traditional). Apparently, that was the comparatively easy part. From there, he faced a painstaking post-production phase extending over a whopping three years. The film was finished only about two hours before the absolute final deadline. Nothing like a ticking clock, as they say. No question, he took on a gargantuan task with very high stakes. Also, with the shooting having been completed four to five years ago, the (none-too-subtle) political message takes on a different perspective. At least when it was conceived, it was a little less so-what-else-is-new? than it is now. Thus, we see an unfortunate downside to a heavily CG laden work – your message can get old as you invest the time needed to carefully craft every digital image. However, it was amidst all this techno-talk, most of which went straight over my head, that I started to see where Cameron likely veered off track with his script. A tip off was when he spoke of working on “character design” while describing that early creative phase during which most writers would be concerned with “character development.” He was talking about the year and a half long R&D period. “It’s always desirable to have a finished script before you start,” he conceded. “But we decided to start without one. This gave the advantage that while writing the script I could surround myself with the art work of the characters and the forest.” Okay, maybe there’s an advantage there. But what I hear in that statement is a de-prioritizing of story development in favor of the process of manifesting it on screen. I was reminded by this of how Quentin Tarantino spoke of his writing and directing processes back in December. (See “Tarantino-mania” from 12/9/09.) In contrast to Cameron’s simultaneous immersion in the problems of how to manifest the film, Tarantino claims that he largely forgets how to direct while he’s in his writing phase. This indicates to me a prioritizing of the writing, indeed, of the story itself, over the directing, which is simply the effort it takes to realize the story. While Tarantino is engaged in writing he has no idea how he’s going to direct what’s coming out of him. He just wants to make sure he is following his writing impulses wherever they need to go and being thoroughly responsible to his characters. For Tarantino, it is essential to create a solid barrier between his writer and director selves. Cameron was happy to let the two mix and mingle under the assumption that they will surely trade ideas back and forth as they work toward their mutual goal. By my estimation, what happened instead was, in age-old Hollywood fashion, the writer got kicked aside and the director dominated the picture. I understand there was a necessity in that. With a budget reported to be in the vicinity of $250 million, Cameron is bound to his investors to create a visual thrill ride. That’s got to be his first priority. With such a high financial risk, he can’t afford to take a lot of artistic risks. That would be manifestly irresponsible. That would be like doing the kind of thing that Terry Gilliam would do. 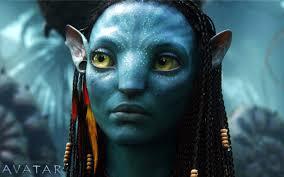 In fact, I wasn’t inclined to begrudge Avatar any of its success until it got the Golden Globe award. It’s a film that’s designed to make a lot of money. To resent it for that would be silly. But to judge it among its peers is to hold it to a higher standard. According to the film-as-thrill-ride standard, Avatar is a masterpiece. As a film drama? Up against The Hurt Locker, Precious, A Serious Man and Inglourious Basterds? Does it really meet that standard? This is why I’m not really looking forward to watching the Academy Awards this year. Even though I just might go see Avatar a third time to catch the Imax experience. See, in the Q and A period, Murch had asked Cameron if he thought the future of 3D would likely go the way that color film did in replacing black and white. Cameron said, yes, and backed it up with the fact that what caused color to finally gain dominance over black and white was color television. When people had color in their homes, they were no longer interested in watching black and white in the movie theater. Likewise, it is inevitable that 3D will become the standard, but how will depend on when it starts to appear on other platforms, such as your laptop or your iphone. When it becomes the norm in those arenas, which it surely will, then it will be de rigueur in the moviegoing experience. All good news to me, since now I want to see everything in 3D. (Although I do have to take issue with Cameron’s producer Jon Landau when he said: “3D enhances the narrative storytelling process.” I’m not sure I see how that could be true.) But back to me and Murch. So then I thought, Now what do I say? Wait, this is Walter Murch. He must have opinions of his own on the subject. So I asked, “Did you agree with his answer?” To which Murch said, “Basically, yes. Although there’s still the problem of the glasses.” The glasses! Good point! Forgot about those. I asked if he knew of any progress in the direction of solving that problem. He said, No, none that he’s seen. We were standing in the lobby by then and next thing I knew Jon Landau was standing on the other side of me. I said, Hello, introduced myself and said something complimentary about the talk. He was very friendly and polite. But then he reached past me to introduce himself to the tall guy on my right. Oh, I get it. He doesn’t want to talk to me. He just wants to meet Walter Murch, too. They immediately started getting into it about Imax 3D, strobe effect, blah, blah, blah, all going straight over my head. So I quietly slipped away.